just looks like he's about to explode. Well, that match on Saturday sure was fun, wasn't it? Perhaps that's the catalyst for an improvement in form, just as it was last year, just as I've been saying it could be all along. But, it's back to business straight away, and Arsenal have a job to do. Three points get Arsenal to 10 in the group, which could ensure qualification to the knockout phase if Schalke also wins. If Olympiacos gets a result, things get a little more tricky, but clearly, they will be much trickier if Arsenal does not get all three points tonight. To put it simply: Arsenal qualify for the knockout stage if they win AND Schalke wins. If Arsenal wins and Schalke draws with Olympiacos, the Greek side can still better Arsenal on goal difference after Matchday 6. If Olympiacos wins, then both the Greek and German sides can finish above Arsenal, even if Arsenal wins tonight. Arsenal will need a win and help from Schalke to make the trip to Athens on Matchday 6 less meaningful. Montpellier is out of the competition, having only picked up one point in four matches. They will be looking to play the role of spoiler. Arsenal cannot allow that to happen; not only would it make qualification difficult, it would also undo all of the positive vibes from the derby win. And we can't have that happen now, can we? O. M. GIBBS. 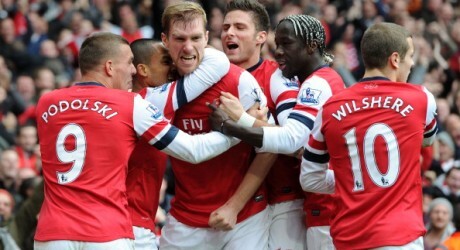 Photo: Arseblog News. Kieran Gibbs and Gervinho have made their returns to training from thigh and ankle injuries, respectively, and could feature tonight, though I doubt either would start. Theo Walcott has been left out of the 18-man squad with a shoulder injury he picked up against Tottenham, though his time out will likely be "short term". Andre Santos is also left out of the squad after picking up a abdominal strain on Saturday. Arsenal's form really went in the tank after Gibbs's injury, to the tune of three wins, three losses, and two draws across all competitions, so having the Englishman back at left back is a tremendous plus for the Gunners. Arsenal's "long term" injuries now just include the perma-crocked Abou Diaby, Tomas Rosicky, and Lukasz Fabianski. Team news for the opponents in the Champions League is always light, so my apologies. As far as I can tell, Montpellier have only one long term injury concern and that's Moroccan forward Karim Ait-Fana, who has been out with a knee injury he picked up in training. Senegalese international Souleymane Camara serves a one match ban for accumulating three yellow cards. Arsenal blew a two goal lead on Matchday 4 in Germany. As mentioned earlier, Arsenal won just three of the eight matches Kieran Gibbs missed through injury. They have won exactly half of their games this year (nine of 18), and that's across all competitions. In the league, it's five wins over 12 games, and that's just frankly not good enough. Meanwhile, Arsenal's opponents tonight, Montpellier, are sitting in 14th place in Ligue 1. They have won just three in the league over 13 matches. They are unbeaten in four, however, that has comprised of a win and three straight draws. However, and of note to Arsenal, Montpellier have only been kept off the scoresheet once this season, across all competitions. That feat was accomplished by Marseille, who won 1-0 in Montpellier on August 26. Montpellier have scored in 15 consecutive matches across all competitions. They have goals in them and clean sheets have been hard to come by for Arsenal; Arsenal have kept just one clean sheet (1-0 over QPR) since opening the season with three straight. Podolski brought Arsenal level. Photo: Daily Mail. Montpellier and Arsenal have only met once before, on Matchday 1 in France. 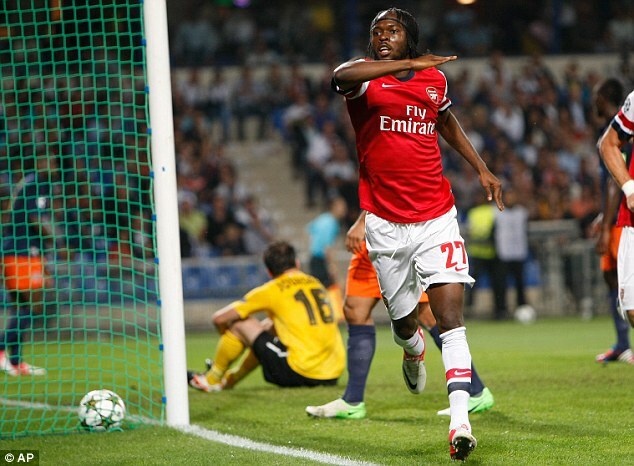 Montpellier went ahead from the penalty spot in the ninth minute before Lukas Podolski and Gervinho scored two minutes apart to give Arsenal a 2-1 lead. Montpellier pounded on the door to get an equalizer the rest of the way, but Arsenal held strong, and left France with three points. Arsenal have played eight home matches against French competition in the past and have a surprisingly poor record in those matches: three wins, three draws, and two losses. Last year, Marseille picked up a 0-0 draw at the Emirates. Prior to that, in 2002, Auxerre picked up a 2-1 win at Highbury. Lyon got a 1-1 draw in 2001. Arsenal picked up two of their three home wins against the French in the 1999/2000 UEFA Cup, against the likes of Nantes and Lens. Lens won in the 1998 Champions League in London, 1-0. Auxerre earned a 1-1 draw in the 1995 Cup Winners' Cup quarterfinal (Arsenal won the return leg in France.) The one other Arsenal win came in the 1994 Cup Winners' Cup semi-final, over PSG, en route to winning that final. As for Montpellier's record in England, they've played on English soil once, at Old Trafford, in the 1991 Cup Winners' Cup, and got a 1-1 draw. Brian McClair fired United ahead in the first minute before Montpellier pulled level on a Lee Martin own goal just seven minutes later. United won the return leg in France 2-0 to win the tie. The match officials for tonight's match are from Turkey; the referee is Istanbul-based Firat Aydinus. This will be Aydinus's third Champions League match as referee. You might know that referees often have interesting side professions; sometimes it goes beyond thought that they must have other jobs during the week in addition to their refereeing on the weekend. You may have heard that Howard Webb was a sergeant with the South Yorkshire police. Massimo Busacca, whom you may recall thinks not hearing the whistle is a bookable offense, owns his own business. Firat Aydinus, on the other hand, is a geologist. Aydinus's other two Champions League matches, both from this season, were Bayern Munich's 2-1 win over Valencia on September 19 and PSG's 2-0 win over Dynamo Zagreb on October 24. This is his first match involving an English side. So, Chelsea are in some trouble, eh? After last night's 3-0 Chelsea loss in Turin, combined with Shakhtar Donetsk's 5-2 win over Nordsjaelland, Chelesa need a win over the Danish side and a win from Shakhtar (who are already through) to advance. A draw between Shakhtar and Juventus is enough to see both sides through at Chelsea's expense. Manchester United are already through as group winners, so they were able to start a youthful lineup in Turkey, where they lost 1-0 to Galatasaray. Elsewhere in their group, CFR Cluj beat Braga 3-1. Benfica beat Celtic 2-1 to give themselves a leg up on the Scottish side for second place in the group, though Benfica's remaining match is against group winner Barcelona at Nou Camp. Barcelona won 3-0 at Spartak Moscow. Elsewhere, Lille beat BATE Borisov 2-0 in Belarus, while Valencia and Bayern Munich drew 1-1. That draw was enough to send both of those sides through. As you know from reading the rest of this preview, and also via the process of elimination, Group B's other match features Schalke 04 and Olympiacos, who will face off in Gelsenkirchen. Group C features an early match in Russia, as Zenit hosts Malaga, while the other Group C match sees Anderlecht host AC Milan in Belgium. In Group A, Dynamo Kyiv hosts PSG in Ukraine and Porto hosts Dinamo Zagreb in Portugal. As for the Group of Death, Manchester City is home at Eastlands to face Real Madrid and Ajax hosts Dortmund in Amsterdam.